The unseasonably warm fall was caused by the “Godzilla El Nino,” the second strongest on record. He said the industry could be facing a 10 percent loss, and there’s not much that can be done about contracts with large retailers that were set earlier in the year. Evergreen trees require cold temperatures in order to go dormant. Christmas trees and boughs harvested while trees are still actively growing will lose their needles faster, and that means a shorter shelf life. According to Nic Loyd, WSU’s AgWeatherNet meteorologist, very few places in western Washington have been consistently below 40 degrees this fall. The bulk of the state’s holiday greenery is harvested west of the Cascade Mountains. Summer drought also challenged the $50 million holiday greenery industry. “Dry weather knocked the heck out of the needles,” Freed said. But for harvesters who manage to find high quality raw materials, the price is good. Freed estimates that 5 million finished wreaths, and other holiday greenery, leave the region this time of year for destinations that include other states and international markets. Florists use evergreen boughs as filler for floral arrangements throughout the dormant season, January to the end of March. Most greens for holiday decorations are sold by companies that obtain permits to harvest material from trees like noble fir, white pine and Douglas fir on public land or land owned by private timber companies. Because of the late start this year, companies have had to hire more seasonal labor to harvest and process boughs into swags, centerpieces, garlands, mantle decorations and wreaths. In the United States, wild gathering dominates the industry, although Freed said that, to add a measure of control, some companies are beginning to experiment with “bough orchards” – managing trees specifically for the greenery market. In Denmark, for example, trees are managed for bough production by leaving a skirt of branches on the lower part. As the tree grows taller boughs are harvested every year from the skirt. This practice, known as coppicing, can be repeated for 20 to 30 years and produces a more reliable harvest. In forests where timber is not harvested, such as in high elevation stands of noble fir, white pine and Douglas-fir, federal and state landowners are starting to consider managing for boughs. A stewardship lease with a harvester helps maintain forest health through pruning and thinning. The arrangement produces income and saves money for the landowner and provides access to a more reliable source of raw material for the harvester. Holiday greenery businesses are also looking to diversify their income streams by producing wreaths from alternatives to noble fir, and large retailers are interested in offering multiple price points. 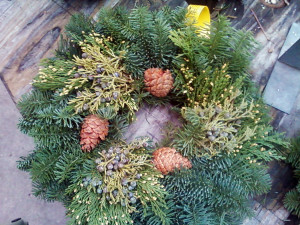 Wreaths made from less traditional but more plentiful Douglas fir, for example, offer shoppers a budget option. Freed will retire at year’s end, completing a 43-year career focused on teaching landowners around the world how to manage forest plants for commercial and personal interests other than timber uses.